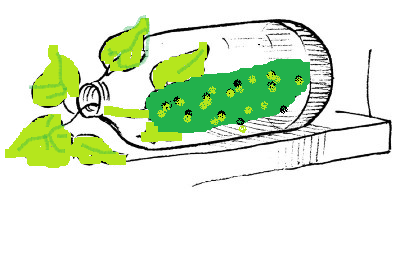 If you enjoy novelties, growing a cucumber in a bottle may be just the thing for you. With a little patience, you can grow a full-size cucumber in a bottle that can't be removed without breaking the bottle. Although there is no magic involved in this old-timer's trick you will create a great conversation piece. Select a bottle with a small mouth for the best effect. Wash and dry the bottle and head on out to the garden. The mouth of the bottle need to be large enough to slip a miniature cucumber inside, but small enough that a mature cucumber cannot fit through the opening. Slip a tiny cucumber into the bottle being careful not to damage the vine. You may wish to add a strip of tape to prevent the cucumber from slipping out, but use caution not to get the tape on either the cucumber or the vine. Cover the bottle with vines to shade it from direct sunlight. Leaving the bottle exposed to direct sunlight will cause the interior to heat up on sunny days and will cook you cucumber. Check the cucumber daily and tuck it back into the bottle if it begins to slide out. Don't worry. Within a few days your cucumber won't be able to fit through the mouth of the bottle. Water your cucumber plant every few days to keep the soil evenly moist - using care not to get water in the bottle. If the bottle fills with water, gently pour the water out of the bottle. Too much moisture inside the bottle may cause your cucumber to rot. Monitor the growth of the cucumber carefully to make sure it doesn't get overly ripe. Your goal is to grow a crisp, green cucumber - not a yellow one. Cucumbers grow quickly and yours should be ready for harvesting in 7 to 10 days. Cut the cucumber from the vine when it reaches the desired size. The cucumber will slip further inside the bottle leaving your visitors wondering how it got there. You can pickle your cucumber, if preferred, by following your favorite pickle recipe and processing the sealed bottle in a boiling water bath. Pickled cucumbers can be kept as a showpiece for years - whereas a fresh cucumber will only last a few days. If you intend to pickle your cucumber make sure the bottle can be sealed and processed properly. This makes a great conversation starter or project for kids to enter in agricultural fairs. So go ahead, gather up some bottles and put the youngsters in your life to work growing the seemingly impossible cucumber in a bottle.